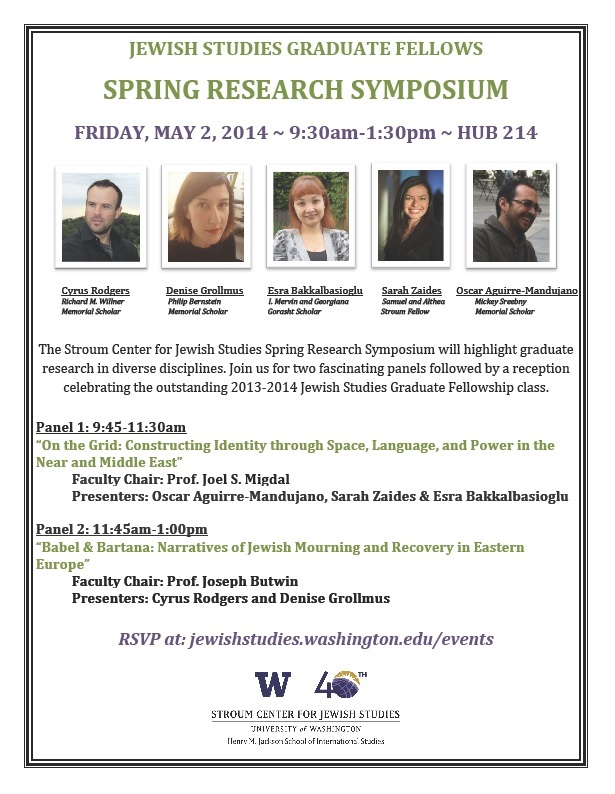 The future of Jewish Studies scholarship will be on display at the Stroum Center’s second annual Spring Research Symposium, featuring the 2013-14 class of Jewish Studies Graduate Fellows. Join us for two fascinating panels followed by a reception. RSVP here to reserve your spot. Last year’s symposium was completely sold out! Click here to find out more about the fellows and their diverse research interests, which include Ottoman Turkish poetry, Bedouins and solar energy in Israel, Ladino newspapers, post-Holocaust films, and Russian-Jewish culture. About our fellowship program: The goal of the Jewish Studies Graduate Fellowship at the University of Washington is to build an intellectual community around Jewish Studies. Fellows participate in a workshop series to foster professional development and advance their research agendas. Now in its second year, the Fellowship is coordinated by Dr. Hannah Pressman, an affiliate faculty member of the Stroum Center for Jewish Studies. Thanks to the generosity of our community supporters, five outstanding graduate students received $3,000 grants to support research related to Jewish Studies during the 2013-14 academic year. Our five new graduate fellows represent several UW departments. Each brings a unique perspective to the field of Jewish Studies and has great potential to contribute to the future of Jewish scholarship. 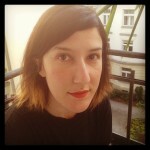 Esra Bakkalbasioglu is a second year PhD student in the Interdisciplinary Program on Near and Middle Eastern Studies. She completed her BA and MA degrees from the Political Science and International Relations Department of the University of Bogazici, Turkey. She wrote her master thesis on the West Bank Wall and non-violent anti-wall movements. After completing her MA degree, she worked for two years as the Democratization Program project coordinator, in one of Turkey’s prominent think-tanks, Turkish Economic and Social Studies Foundation. Her main areas of research interest are infrastructure-politics relations, social movements and state-society relations in the Middle East. 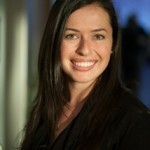 Currently, she is working on the political and social impacts of solar panel fields in Israel, Turkey and Jordan. Oscar Aguirre-Mandujano is a second-year PhD student in the Interdisciplinary Program in Near and Middle Eastern Studies at the University of Washington. He was born in Mexico City in 1986 and attended the National University of Mexico (UNam). 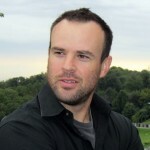 In 2008 he obtained a BA degree in History, and in 2009 he moved to the United Kingdom to read an MA degree at the School of Oriental and African Studies of the University of London. Oscar’s dissertation undertakes an interdisciplinary study of the impact of book production in the emergence of a new court literary culture during the reign of Bayezid II (r. 1452-1512) in the Ottoman Empire. As a Jewish Studies Graduate Fellow, Oscar focuses on an in-depth study of the original compositions of Yehuda (Leon) Behar in Ottoman Turkish, and examines the development of the main themes in the poetic and literary work of the Jewish community of the late Ottoman Empire. Denise Grollmus is an award-winning journalist and Fulbright Scholar. After receiving her MFA in Creative Writing from Penn State University, Denise lived in Warsaw, Poland as a Fulbright scholar researching the Revival of Jewish Life throughout the country. 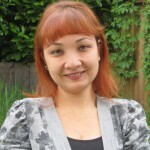 She is now a PhD candidate in English at the University of Washington. Her project is a comparative study of Philip Roth’s novel Operation Shylock: A Confession and Yael Bartana’s film series And Europe Will Be Stunned… that examines how the satirical representations of counter-Zionist movements in both works perform and extend Hannah Arendt’s critique of the nation-state by performing the problematics not only of Jewish nationalism, but also of nationalism (especially with regard to “The Jewish Question”) more generally. In 2011, Cyrus began his master’s degree in the Slavic Languages and Literature Department at the University of Washington. His main interests are Soviet literature, film, and visual art with special emphasis on Jewish themes in literature. Next year he will graduate with plans to complete a Master’s thesis, which will discuss the relationship between art and Bolshevik politics at critical stages in the evolution of the Judeo-Soviet paradigm from 1917 to 1953. Sarah’s work studies the cultural and social histories of Jews in the Soviet Union, particularly around the early years of Israeli Independence. Her current project examines the historical enigma of Arkady Raikin, a yeshiva-educated Jewish actor who became one of the most famous satirists of the Soviet state. Her work uses the case of Raikin to engage broadly with the historiography of Soviet Jews and also employs the transnational histories of emigre communities in the United States and Israel. After a successful year in the first class of Jewish Studies Graduate Fellows, Sarah returns to continue her research in Jewish Studies.